1. Based on the information provided in the cartoon, which of the following is an example of a false document? 2. The above cartoon is an example of which of the following? As per the cartoon, a false document is when you quote (not read) material that doesn’t exist. The Old Testament exists, as does news bulletins. 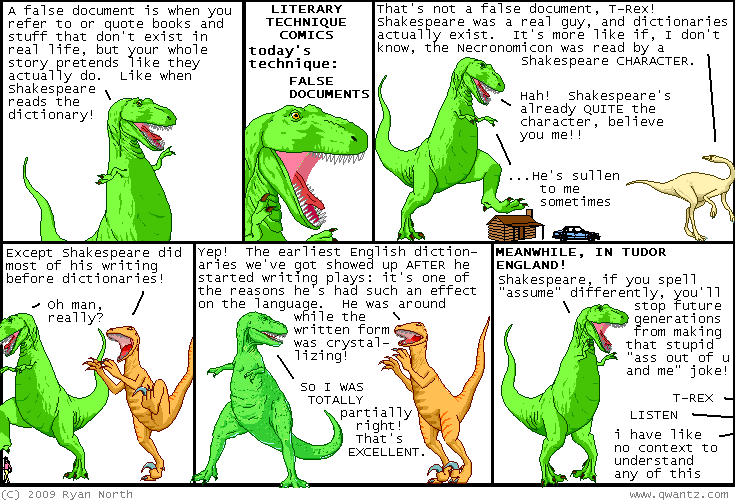 The Internet and therefore Dinosaur Comics did not exist in 1588, so this is the false document here. An anachronism is something misplaced in time, a chronological inconsistency. In this case it is dinosaurs referring to shakespeare – who has no context to understand anything they are saying. A parachronism is something that appears outside of the time period which it would normally be found – though it is not so removed as to be impossible, just unlikely. Pathetic fallacy is the attribution of human emotions to inanimate objects or things like the weather. Metaphysical conceit is an extended and unusual poetic metaphor. Not applicable here.